The world of bicycle components is generally ruled by a "2 out of 3" rule. A single part can generally meet two out of three performance goals. For road tires, these goals are speed, grip/road feel, and flat protection/durability. If the first two goals are most important, racing & performance tires are for you. These tires are designed to provide maximum speed (low rolling resistance) and optimal handling (grip while cornering). Race tires tend to be the flagship products of most tire manufacturers. They receive the most promotion and the most research and development dollars, and they tend to be the most expensive. Racers and fast recreational riders will most appreciate the high speeds and agile handling afforded by performance tires. Recreational and touring riders will probably be happier with the more durable (and less expensive) tires found in our training & recreation tires section. While tires in this section are not high-mileage all-season tires, they are by no means fragile. A good pair of performance tires will typically last 1,500-2,000 miles when ridden in good conditions. While their light weight makes them more susceptible to punctures, performance tires shouldn't fail except in the event of at least a moderately significant hazard, such as a sharp piece of gravel or a shard of glass. Casing: The foundation of tire construction. This is the cloth that provides resistance against stretching, allowing the tire to hold pressure while remaining flexible. Usually the casing is made of nylon, but cotton and silk casings are sometimes used. Traditionally, racing tires were evaluated in part on the basis of the Threads Per Inch count of their casing—the higher the TPI, the better. 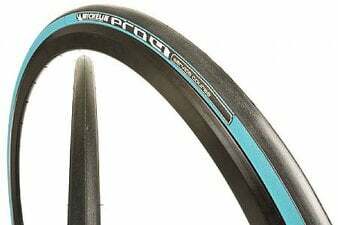 Modern race tires use advanced rubber compounds that somewhat diminish the importance of the high TPI casing, but these casings do tend to result in more supple tires with better ride quality. 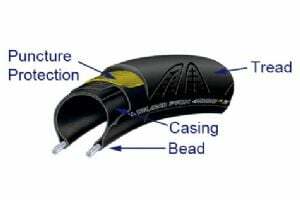 Bead: In a clincher tire, the bead is the part of the tire that "clinches" the rim and keeps the tube securely inside the tire. These beads can be made of Kevlar strands or wire. Wire beads are cheaper, but they're also heavier. Kevlar beads are lighter but more expensive. However, they have the added benefit of allowing the tire to be folded into a very small package; this is why tires with Kevlar beads are often referred to as "folding" tires. Almost all mid- to high-quality racing and training tires utilize Kevlar beads. Puncture Protection: In many tires, a rigid layer between the casing and the tread provides some measure of puncture protection. This layer may consist of polyester, nylon, a high-tech material like Kevlar or Vectran, an extra casing layer, or just another layer of rubber. Many tire companies develop brand names for their particular puncture protection technology, like "Raceguard" or "PRS Puncture Resistance System," but they all use similar methods. Tread: The tread material is the most obvious point of differentiation between tires. Tire brands and models all use distinctive rubber formulas to maximize certain qualities of each tire. Supple treads provide the best grip and the least rolling resistance, but wear out very quickly. Rigid treads have increased wear and puncture resistance, but increased rolling resistance and diminished grip. Many manufacturers use multiple tread patterns in a single tire to try to maximize performance. One of the world's largest tire manufacturers, Michelin originally made their name with bicycle tires, and they continue to produce a wide variety of bike tires for all cycling applications. Michelin's flagship bicycle tire is the Michelin Power Endurance Tire, which replaced and improved upon the well-loved Pro4 Service Course, which in turn replaced and improved upon the Pro3 Race... you get the point. Michelin has continually striven to improve upon an already winning design, and the result is a truly excellent all-purpose road racing tire. The Michelin Power Competition Tire is an even lighter and faster version, with a more supple casing for a super-smooth and responsive ride and outstanding control in any competitive scenario. If you love the Pro4, consider training with the Michelin Pro4 Endurance Tire, which has many of the race version's great qualities, plus improved durability and puncture protection. Conti's flagship performance tire is the Continental 2013 Grand Prix 4000 Road Tire. It's comparable to Michelin's Pro4 Race in durability, puncture resistance, and cornering, but is generally considered to give a softer road feel. The GP4000 features Continental's patented Vectran strip between the casing and the tread—this puncture-resistant layer gives the tire excellent flat resistance. The Continental 2013 Grand Prix 4000 S is essentially identical to the black version of the regular GP4000 (just with sleeker graphics)—both feature Continental's top rubber compound, Black Chili, which can only be made in, you guessed it, black. Black Chili is an incredibly dense rubber, made up of particles roughly ten times smaller than those typically used in bike tires. The resulting material increases the tire's ability to conform to (grip) the road and also adds to its durability. It's resistant to UV rays, helping the tire to avoid cracking and premature wear. Conti's road race offerings continue with the Continental Grand Prix Attack/Force Clincher Tire Set, a pair of front- and rear-specific tires optimized for aerodynamics, power transfer, and handlig. This set also features Black Chili, as does the ultra-lightweight, ultra-fast Continental 2013 Grand Prix Supersonic w/ Black Chili, with low rolling resistance that rivals some of Conti's racing tubulars (we'll get to those). Vittoria's is the logo spinning 'round on the wheels of the vast majority of professional teams. Even teams with conflicting sponsorships will ride Vittoria tires with their sponsor's name crudely printed on the side. Of course, most pro teams rely on tubulars, but amateur and recreational riders often prefer to stick with convenient and relatively inexpensive tubulars. You can still ride the pros' choices, though. The Vittoria Open Corsa CX III Clincher Tire is a clincher version of a tubular favorite, and its 320 TPI casing is so supple Vittoria actually markets it as an "open tubular." 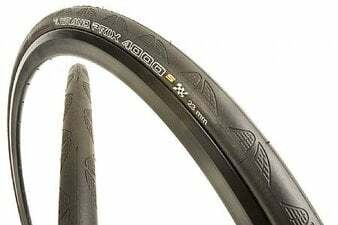 And the Vittoria Open Pave CG III Clincher Tire is the clincher version of the tire that delivers many riders to the finish at races like Paris-Roubaix and the Tour of Flanders—it's a tough cookie. So, with all this hype, is there a downside? Well, yes; the Corsa CX is one of the faster-burning tires you'll find. Expect to get about 1,000 miles out of it. Vredestein is a Dutch tire manufacturer. Though less well known than Michelin or Continental, their product line is no less impressive. The Vredestein ZDNU Fortezza TriComp is a favorite of our customers, and is comparable to the Pro4 or the GP4000. The Vredestein Fortezza Superlite is a super-light choice for race day use, comparable to the GP Supersonic. Tufo is a leading manufacturer of tubular tires, offering a wide range of road tires for training and racing. The company was founded by an avid cyclist who had worked for many years in R & D in the tire industry, who decided to make tires that met his own needs and desires and those of other cyclists he knew. 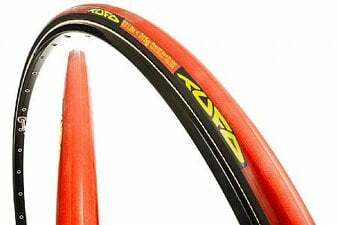 Tufo specializes in tubular bicycle tires, and their product has attracted many loyal riders. In addition to manufacturing traditional tubulars, Tufo also makes "tubular clinchers," which are tires that feature tubular technology but also have clincher beads, for use with regular clincher wheels. The best of both worlds! Many of their best-loved tubulars are available as tubular clinchers; just look for the "C" designation in the product name. The Tufo S3 Lite Tubular Tire is Tufo's best-selling race tire. It's narrow for great aerodynamic performance, light weight, and can be run at a high inflation pressure for low rolling resistance. Just plain fast. The Tufo Elite Jet Tubular Tire is an even lighter option, perfect for races and time trials on good roads. Conti's handmade tubular tires feature the same technology and rubber compounds as in their clinchers. The Continental Sprinter Tubular Tire is a speedy bestseller that features Black Chili, and the Continental Competition Black Chili Tubular Tire (700c) is a lighter, faster tire with impressive flat resistance that also features the innovative rubber compound. This is it: the tire that dominates the pro peloton. The Vittoria Corsa CX III Tubular . What more needs to be said? Yup, even Michelin is in the tubular game now, with a tubular version of the Pro4: the Michelin Pro4 Tubular Road Tire. Tubeless technology, which has already taken off in the mountain biking scene, is getting to be a big deal for road riders as well. Both Maxxis and Hutchinson offer tires specifically intended for tubeless use. Tubeless technology provides the ability to run tires at a lower inflation pressure without the risk of pinch flats, providing both a comfier ride and higher performance—lower pressure means the tire can roll over imperfections in the road surface without deflecting and wasting precious energy and speed. The Hutchinson Atom Tubeless Road Tire features a bead made from unidirectional carbon rather than Kevlar for a super-secure attachment to the rim that won't bottom out at low pressure. The light and fast Atom has exceptional grip, a supple 127 TPI casing, and Kevlar flat resistance. The Maxxis Padrone Tubeless Road Tire features a similar carbon bead and a dual rubber tread compound for a great balance of grip and speed. Whatever your road race requirements, we've got a tire to help you smoke the competition. To see our entire collection, click here. If we can help you choose, give us a call at 1-800-682-0570 or email us at [email protected].